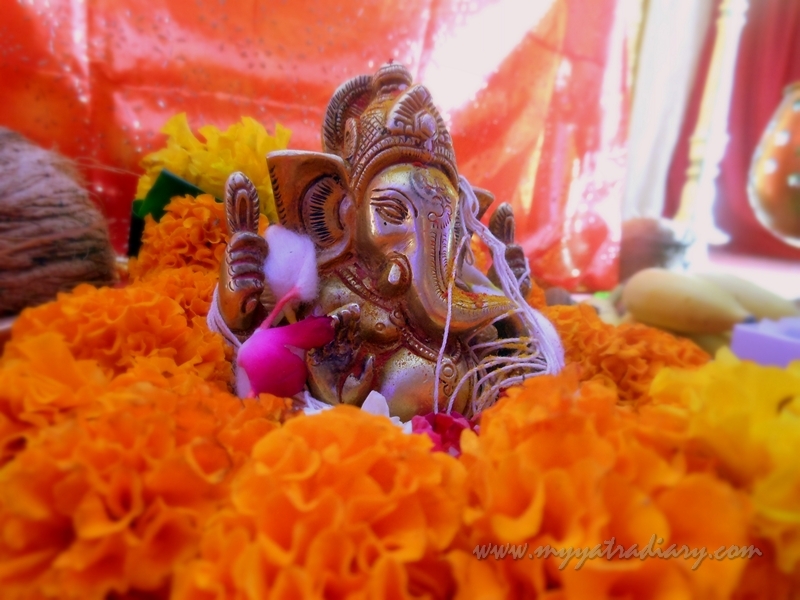 Ganesh Chaturthi Mumbai Pandal Hopping: Day 6 | What Dagdusheth Ganesha tells us about Riches! wisdom is better than silver or gold. 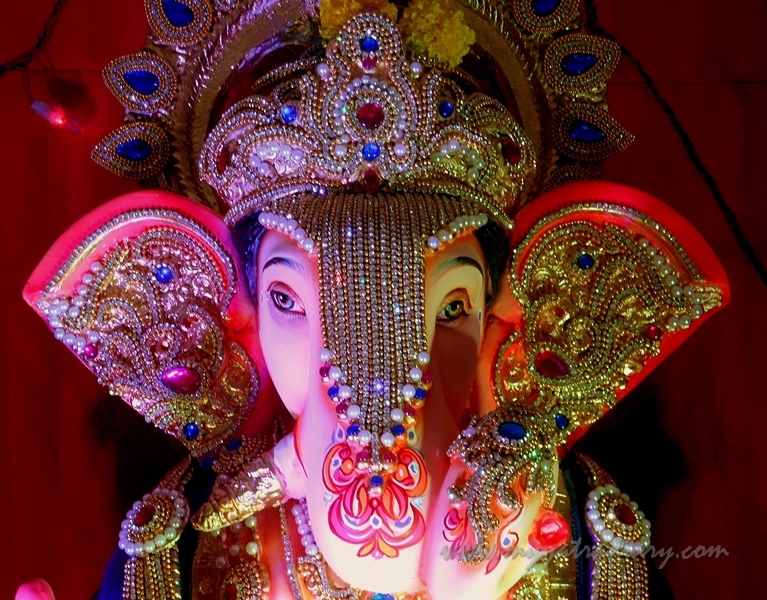 Lord Ganesha is all dressed up in His finery today, adorned in precious pearls, stones and expensive ornaments. Tiny anklets around his wrists and fancy necklaces embellished on His neck, ears and stomach glisten in the lights dancing all around. All our eyes can see is glitter and gold: ruby, topaz, diamonds and sapphire! 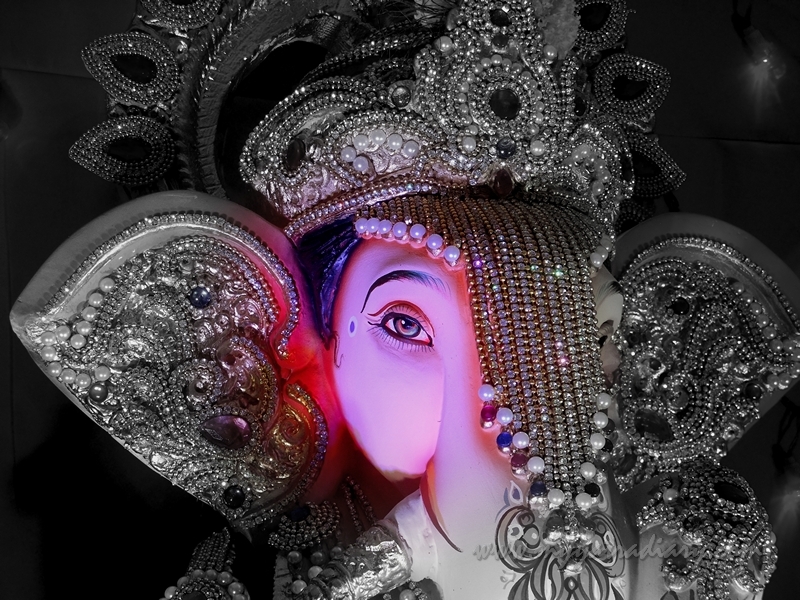 The captivating Dagdusheth Ganesha from my society. But if this picture of His makes you think He’s by any measure materialistic or lured by all the glitter and gold of the temporal world, then it’s time for you to think again. Lord Shiva has taken the appearance of a beggar. How much could he possibly collect in alms, and then spend it in looking after his world? Not much would be left for his own and his family’s use. I am definitely better than him and can do a much better job. 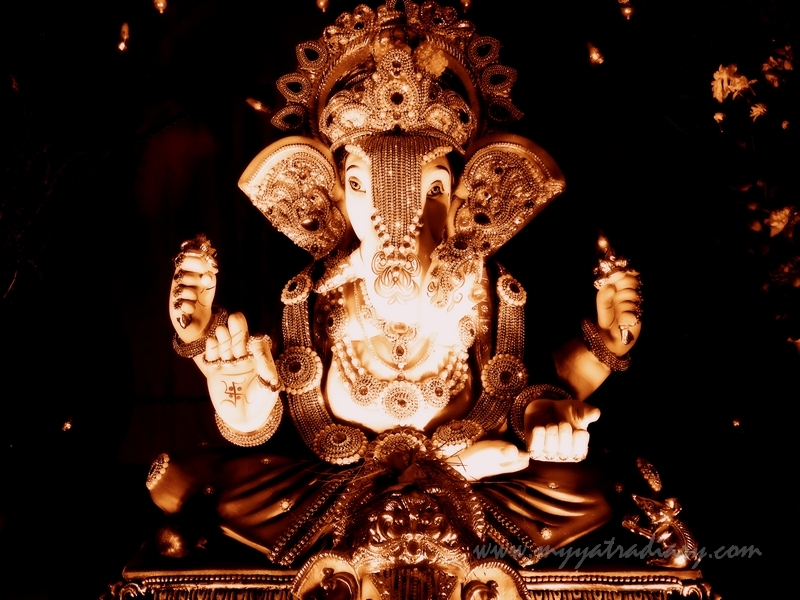 Welling deep in his grandeur and gold, he decided it was time he show this off to Shiva and invited Shiva’s son Ganesha for a grand feast at his palace. 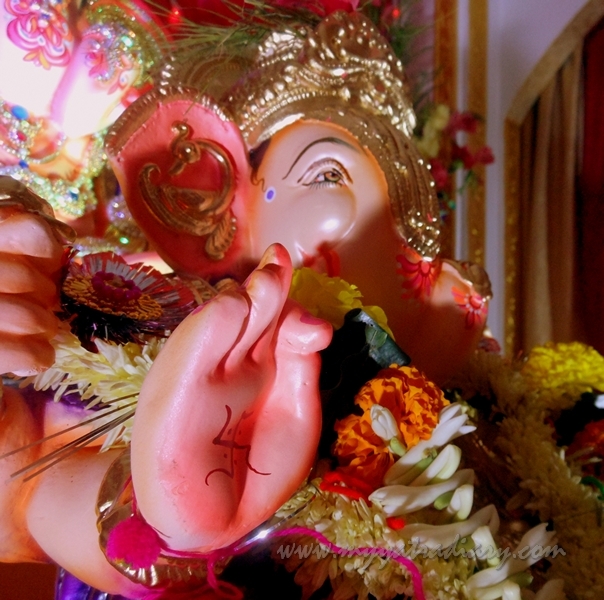 The thought of food made Ganesha ecstatic and he arrived at Kubera’s place revelling in the merry thought of all the delicacies he would be gorging on! 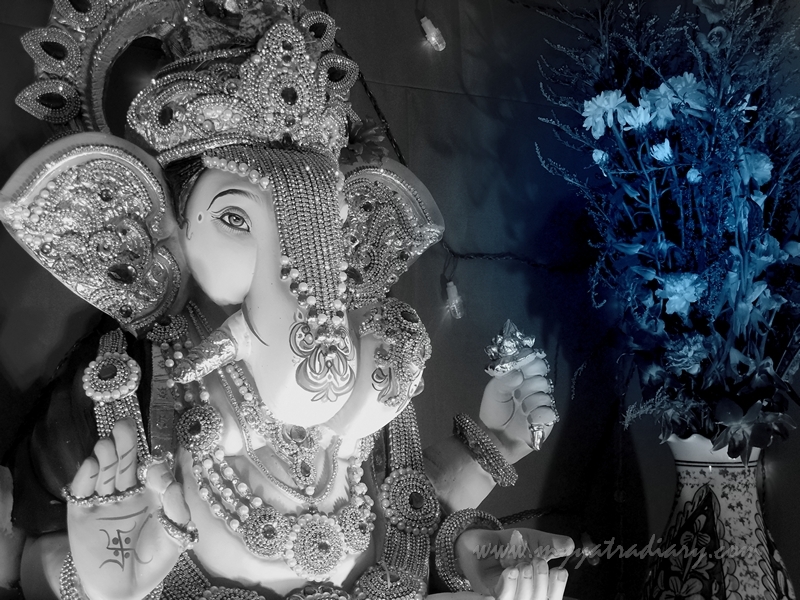 A lavish spread is laid out and in the blink of a second, Ganesha devoured the entire meal. And yet he was still hungry for more. He kept relishing all the food served to him till there was nothing more left in the kitchen. 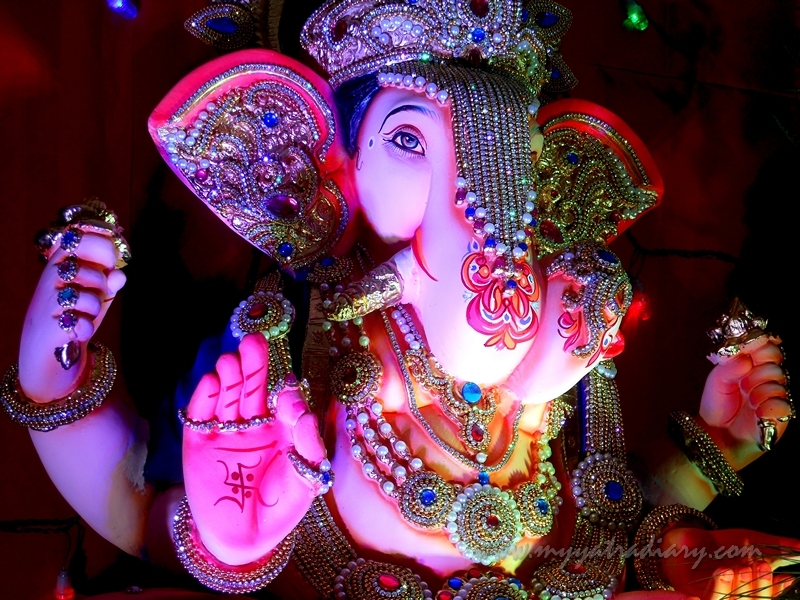 Still hungry, Ganesha startsed eating the golden plates, spoons and anything and everything that he could set his eyes and hands on. When he finished off everything, he looked at Kubera for more. This scared the wits out of Kubera and he ran for refuge to who else but the great sage, Shiva! Shiva then gave him a few morsels of rice which was made by Ganesha’s mother Parvati and told him to serve this to Lambodara. 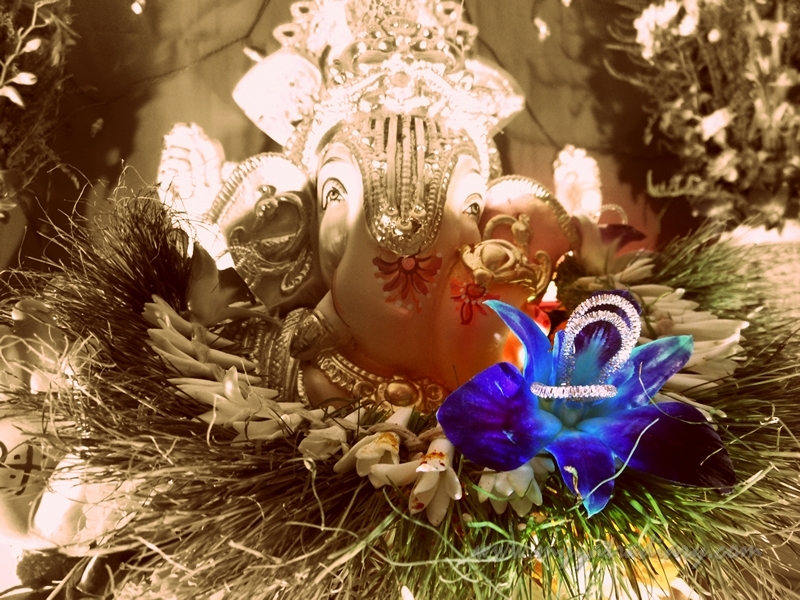 Kubera did as instructed and as soon as Ganesha ate the rice, he was instantly satiated and his hunger subsided. His beauty is supreme but just like this story above, wisdom calls for us to recognise Him through the real treasures that lay hidden. 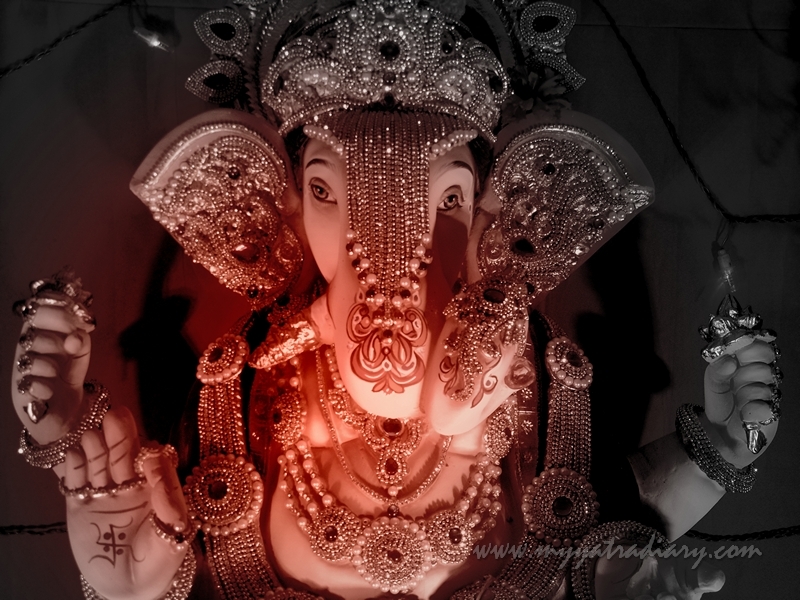 They go beyond all external appearances, for our Gajanana is very much still a people’s man. He feels what we feel and He gives us a message through such episodes in His life. but the lack we feel within our hearts in this money-orientated temporal world? We might have all the pleasures of the world, the material riches and yet there are times, we feel lonely, restless and dissatisfied within. Somewhere, He represents each one of us as in the end He shows us how this hole can be satiated only with the touch of love, as pure and effervescent as that of a mother, and sincere feelings which then lead to peace and happiness. Whatever form we may worship Him – He is always hungry for some earnest and heartfelt love, affection and humility that His people wholeheartedly shower him with. It is from this wisdom that flows the real juice, the wealth of satiation and satisfaction, the real richness of life, the bliss of our soul. Thoughts rich by wisdom of life and love! What a meaningful story and the message you conveyed through it, Arti! He is really people's man. The pics are so tranquil! Thanks for the great work Arti.